Chop, saw, and dig with a root shovel that does it all. Its carbon steel blade is shaped like an inverted V and is lined with rip-saw teeth that make quick work of the roots you might encounter while gardening. The lightweight shovel has an ergonomic handle to feel good while you’re at work, and it’s guaranteed to last a lifetime. Dimensions: 45" x 10.5" x 3.75"
Dimensions: 57.5" x 10.5" x 3.25"
Wonderful. Cuts quickly and deeply in areas that are difficult to penetrate. Great for removing old densely rooted shrubs. It's fantastic! It works well. 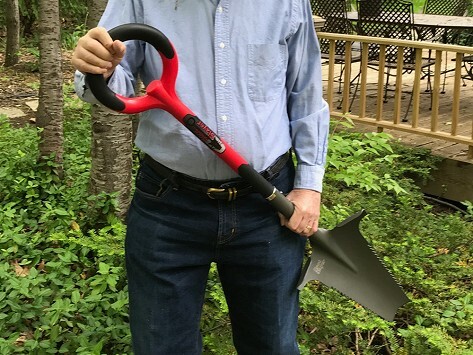 Radius Garden Founder Bruce Baker created the Root Slayer family of root shovels to streamline digging, chopping, and sawing while you’re hard at work in the garden. And because Bruce always has usability and function in mind, his tools are ergonomic, durable, and guaranteed to last a lifetime. These toughened up garden tools are made from strong but lightweight carbon steel, and all have an inverted-V cutting blade that’s lined with rip-saw teeth—this is where the slaying action comes from. The blade’s design is purposefully more narrow than typical tools to give you better access and leverage around roots. Ergonomic grips boost comfort, and there are even smart add-ons—like a twine cutter and bottle opener—built into the trowel and soil knife. These tools are a smarter way to get the dirty, root-removing job done.